How Does a Pop-Up Camper Work? A pop-up camper can be daunting for first-time campers, especially when it comes to setting up. So, how does a pop-up camper work? Setting up your camper will depend on the type of pop-up RV you own. Most use special mechanisms in order to easily “unfold” your camper, others take a more manual work. However different the style of the camper may be, the idea behind their construction remains the same. The main attraction to these types of traveling RVs is that they are meant to be used for convenient travel. This means you can easily go from beachside to campsite with only a few easy steps. Now we will walk to you through the three steps it takes to set up your pop-up camper properly. It’s not that hard really but there are a couple of things to consider and a certain order to the steps. So tag along as we go over the steps. The first thing you will need to do when setting up your pop-up camper is to make sure the terrain is ready to support your camper. After securing your camper on the most level ground you can find, you can remove the camper from your vehicles hitch. 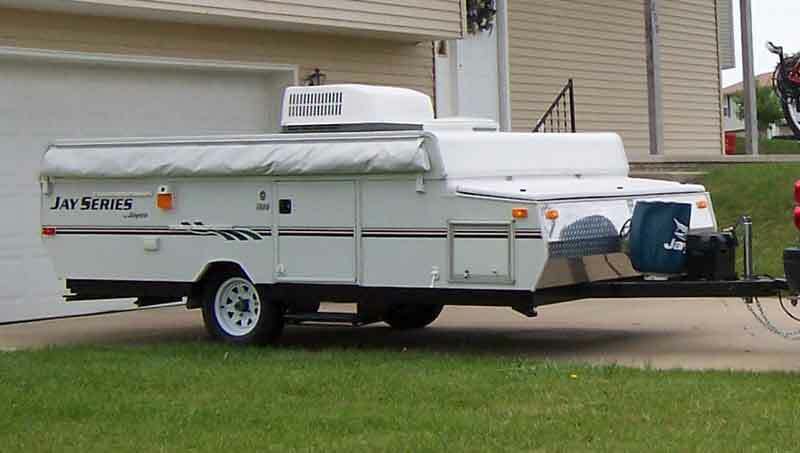 To ensure that your camper is level to the ground, you may need to use to the assistance of a larger scale level. If not, make sure to step back and view your trailer from a distance to try to spot any unevenness. Once you feel comfortable with the placement of your trailer, you should attach a stabilizer to the back of your trailer. Slow and steadily use the cranking mechanism to perfectly align your camper with the ground. It is important to remember that these mechanisms can be tricky so, take your time with this step. Once your camper is level and stabilized, you can now start placing the jacks under the support points of your trailer. You may find anywhere from one to five different jacks, depending on the size of camper you own. The jacks will be conveniently located underneath your camper and will fully lock into position. Make sure that you open the jacks all the way to ensure that they are locked. Remember, safety is the most important part of the unfolding process. Once the jacks are locked and in place, you can begin to open up your camper. Start by unhooking the latches that hold the top of your camper down. Once all of the latches are released, you can insert the camper crank into place and begin turning. Work in slow clockwise motions so as not to damage the mechanics. A good thing to note is that if you are finding that your crank is giving you resistance, to take a step back and make sure it is secured and in place. Do not force your camper to unfold, instead work with the momentum of the crank. When the top of your camper is fully open and locked in place, you can begin to set up the interior of your camper. You should start by setting the door and beds in place. They do more than offer up a comfortable place to lay your head, they also work as a support system for your camper to keep it in place. The same thing can be said for the door of your camper. Once the beds are set in place, test to make sure that they don’t budge. The should fit like a perfect puzzle piece in your camper. Next, test to make sure the door opens and closed with ease. If you find that the door doesn’t quite latch right, you may have a leveling issue meaning that the frame of the door doesn’t match up. This is why it is so important to make sure to level your camper before setting it in place. Once everything is set and secure, you can start setting up the final touches of your pop-up camper. This includes setting up your camper’s canopy as well as unfolding tables and placing your personal touches around your camper. This is a great way to showcase some creativity and style. Customizing your pop-up camper with lovely reminders of a home is the perfect way to take your life with you while on the road. The last thing you will need to do is hook up your electricity and water. If you have chosen to relax at a campsite, chances are there will be these special hook-ups available to you. Electricity hook-ups will require you to plug your camper in. To hook up your water, you will need to locate your camper’s hose to properly get water flowing. Once you light your pilots and set up your sewage system you are ready to rock! We have written a separate article about how to go camping in the winter with your pop-up camper. It’s definitely possible but there are some precautions you need to take an to need to prepare well for the cold nights. The lift system of your pop-up camper is the most important part of the entire mechanism. The system should be treated with care and the more you understand how it works, the better off you will be! While newer models may offer battery operated lifting systems. It is still important to know how to manually work your lift. The main function of your lifting system is to lift your camper off the trailer to prepare to “unfold” your camper top. This works with a series of pulleys and winches. The winch will perfectly connect with the main cable that runs under the roof of your pop-up camper. When working together, they will offer the right amount of tension and weight to open up your camper. The idea behind this special mechanism is that you should be able to unlatch and lift your camper with very little resistance on your part. This also helps to make it a one-man job for solo travelers. This can be achieved by the particular placement of cable and tubes that run along your camper. The tubes will feature specially designed springs that will literally help your camper to “pop-up”. Using a little bit of force and compression that the springs offer, your camper should effortlessly open up. This, of course, works in tandem with the detachable crank. Once the crank is in place, you will be able to gently unwind your camper so that it opens up fully. While this is the most common mechanism you will see, some newer models of campers will also feature specially threaded chains. These chains will attach to the winch as well as a large set in screw. Once you set these styles of campers in place, you will also attach your crank. With the assistance of telescope style poles, you will be able to apply the right amount of pressure to unhitch your camper. Whichever style of pop-up camper you use, the idea behind unfolding your camper remains the same. This is done in hopes of reducing user error so that no damage is done to your camper or its precious lift system. What are the Different Types of Pop-Up Campers? This small type of camper is a great option for beginners. This is because it is easy to set up and far easier to hitch to your vehicle. Once fully opened, an A-frame camper will have a high center peak which offers up more room to move around inside. Unlike traditional campers that feature a solid roof, this type of camper has a tent style roof. This style of the camper is great for 2-3 people because it features an extra bunk style bed at the top which offers more sleeping space for your guest. A hauler style pop-up camper is perfect for people who are looking for a little more off-roading adventure. This is because it features an extra cargo deck to store ATVs and other roaming vehicles like motorcycles and dirt bikes. It’s really great to be able to bring your toys along when you travel. Also to be able to entertain the kids and have fun on the road. A hall wall camper is the more traditional style of camper that you may be used to seeing. This is also the best options for families. Because of the high scale walls, there is much more room inside for sleeping arrangements as well as storage. These campers also usually come fitted with a small scale full working kitchen. The biggest attraction of pop-up campers is that you don’t’ have to travel with limits. You should feel free to park wherever your heart desires. Lightweight and easy to set up campers are the perfect options for adventure seekers who want to get right down to exploring. With special lift mechanisms and sleek designs, you don’t have spent your vacation trying to set up your vacation. With a pop-up camper, you are just a few simple steps away from making nature your personal front yard. However, it is important to remember that you should always follow directions fully when using your pop-up camper. Nothing can ruin an excursion faster than improper camper set up. Not only that, but you can do some serious damage if not worked properly. So, make sure you are ready to unpack your camper flawlessly the first time.